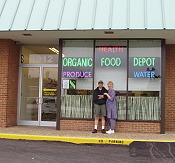 Simply put, we do not share any contact information outside of Organic Food Depot.com(TM) without your permission unless required to by law. If you ever have any questions or concerns about the information you share with us, please feel free to call us at the phone number above or write us at this e-mail address: . We are serious about protecting your privacy and do everything within our ability to ensure your privacy.